I can hardly believe it’s August already! Kids are going back to school (our granddaughter went back July 20!) and college students are getting ready to head back to campus. Everyone is trying to squeeze in just a few more summer activities before Fall arrives. And our vegetable gardens are beginning to wave the surrender flag and give up the last of their bounty for this year. I’ve had a vegetable and herb garden for all my adult life. It used to be huge, filled with peas and butterbeans, corn and squash, okra and tomatoes. These days it’s just a few pots on our deck. And that’s mainly because you can’t grow a dang thing where we live because of the deer and squirrel population here. Oh yeah, plant it and they will come. This year we had a huge crop of blueberries and apples growing merrily in our yard. One day the blueberry bushes were loaded with ripening berries and the next – nothing. The deer really enjoyed that dinner. The same with the apple tree. It was just brimming with beautiful little apples. Until…the squirrels found it. Have you ever seen a squirrel climbing down a tree with an apple in its mouth? I have. Oh well. At least I can still grow a few tomatoes. As long as I keep them in pots and up on the deck where, so far, the deer and squirrels won’t venture. I don’t think I’ll ever get tired of a good, old-fashioned tomato sandwich. I’m talking about the southern classic – two slices of soft white bread spread thickly with mayonnaise, and a thick slice of juicy, ripe tomato with plenty of salt and pepper. Best eaten standing over the sink while the juices run all down your hands. Yum. Close behind that classic, is a BLT. Crispy, perfectly cooked bacon with a lovely ripe tomato and crunchy lettuce. Always a favorite here. And it’s also a combination that I enjoy playing around with. I’ve made it into BLT Smashed Potatoes, BLT Pizza, a BLT appetizer, BLT Pasta, and a Georgia BLT with fried green tomatoes. 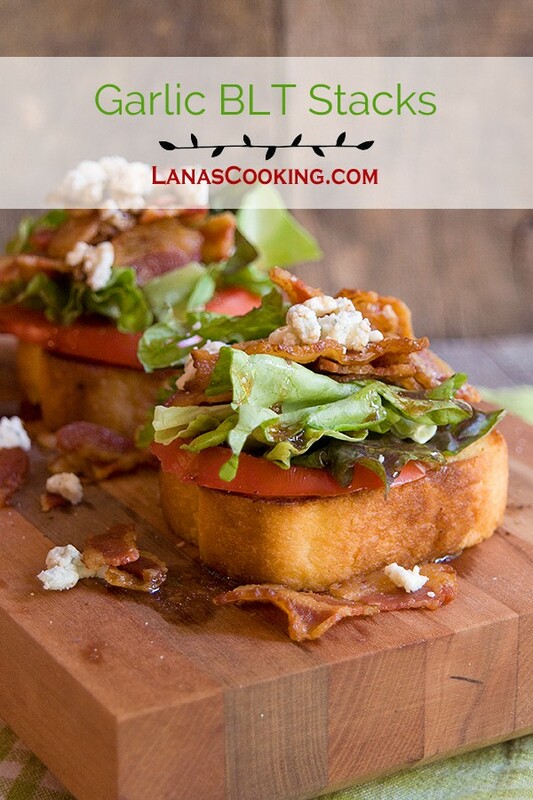 Today, I’m sharing my latest BLT idea – Garlic BLT Stacks. 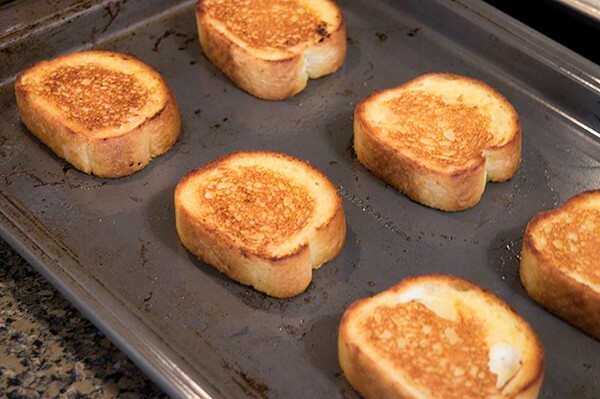 These are open-faced sandwiches built on top of a slice of toasted garlic bread. 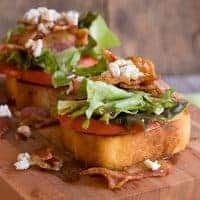 The garlic bread is topped with a slice of ripe, juicy, red tomato, lettuce, feta cheese, and a drizzle of balsamic vinegar. Make it easy on yourself and do what I did – use the frozen garlic bread slices and the pre-cooked microwaveable bacon from your grocer. It makes getting these on the table about a 15 minute job. Can’t beat that! Prepare the garlic toast according to the package directions. Slice the tomatoes. Prep the bacon (either cook your own or use the pre-cooked type available at your grocer). Break the bacon into two or three pieces per slice. 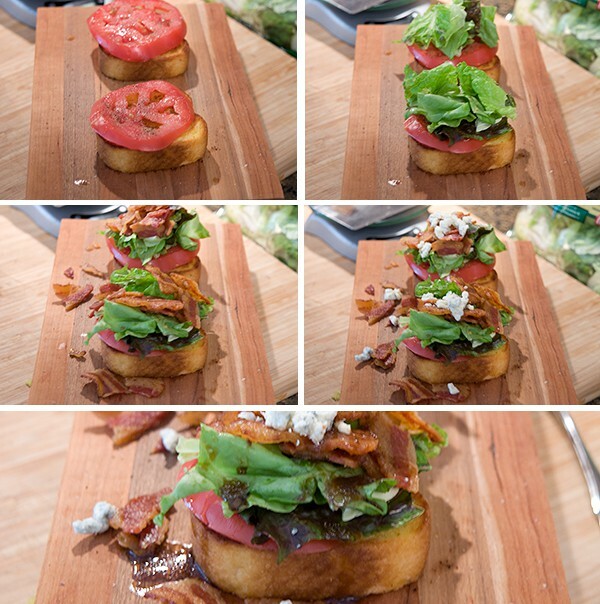 Assemble BLT stacks in the following order: Garlic toast, tomato slice, lettuce, crumbled bacon, feta cheese. Drizzle each stack with balsamic vinegar. Garlic BLT Stacks - garlic bread topped with fresh tomato, lettuce, bacon, feta,and balsamic vinegar. Prep the bacon (either cook your own or use the pre-cooked type available at your grocer). Break the bacon into two or three pieces per slice. Well, I have all of you beat, since I live on a farm and the deer are convinced that we exist to ensure that their dietary desires are constantly met. Plus, this is “the year of the rabbit.” More rabbits than we have seen in decades. Go figure. On the flip side, I have some of the most wonderful neighbors who are among the best farmers in America. They grow fabulous crops, have free range chickens, and a bountiful garden for themselves and their friends. 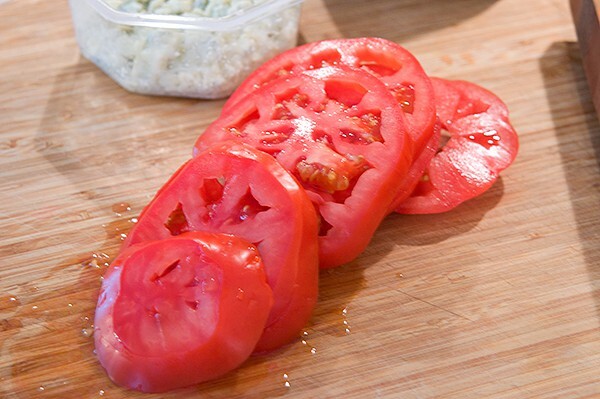 If there are tomatoes in the special place where the fresh picked items are placed, we are free to help ourselves. Nothing better, from folks would could not be better friends and stewards of the land. I want one of these little open faced snacks. Or maybe three. I swear these deer and squirrels post a lookout on our yard to see when there’s something to devour. The deer even lounge in the sun in our backyard most afternoons. Drives me crazy.